This is a card I made for my father in law’s birthday. It uses the stamp set To a Classic. The card base is chocolate chip card stock. layered with Very Vanilla and Elegant Soiree DSP in this striped pattern. I stamped the images in chocolate chip ink on Very Vanilla card stock. 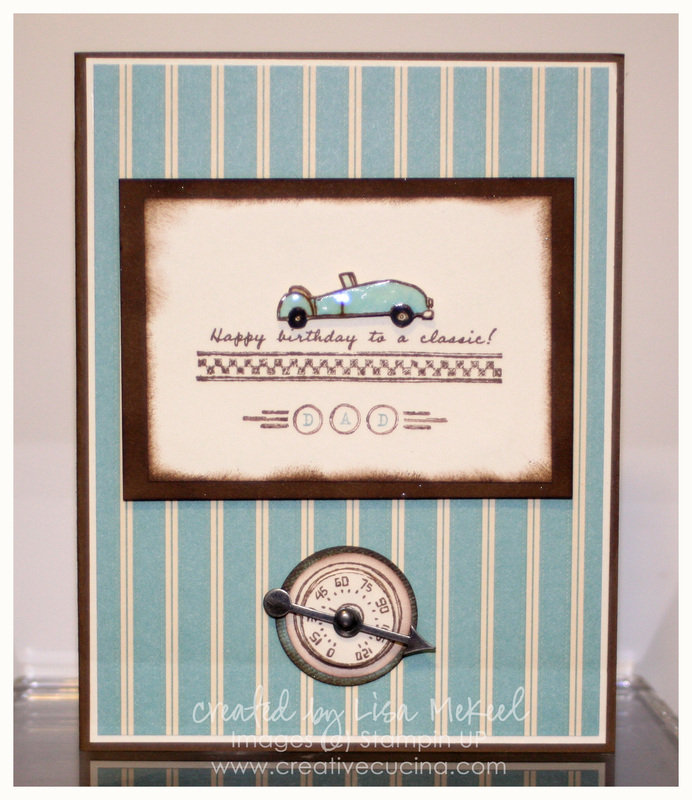 The car and the DAD circles were stamped again on Very Vanilla scrap, cut out and adhered to the base image with stampin dimensionals. The car was colored in with Baja Breeze marker and then topped with Crystal Effects. Around the edges of the stamped layer, I sponged some chocolate chip ink, then matted it onto chocolate chip card stock. 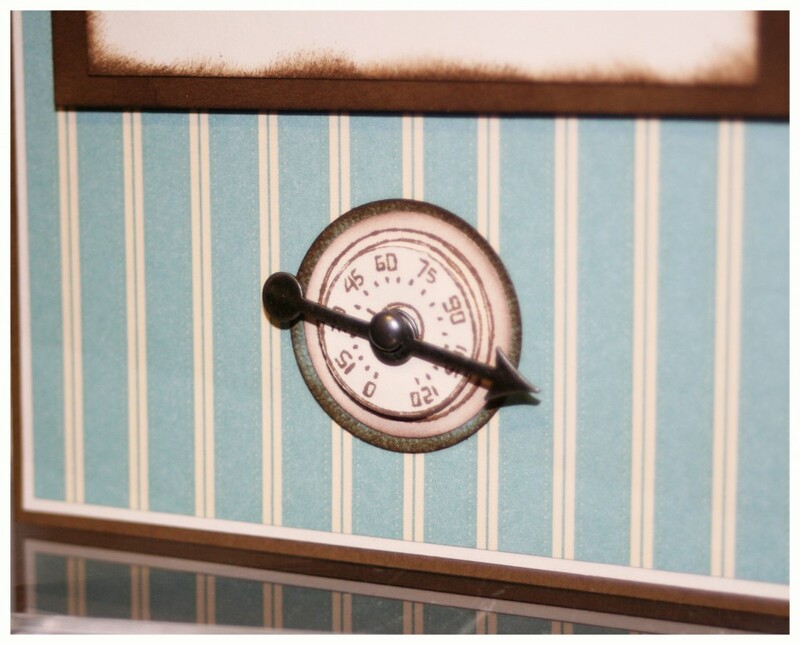 For a fun accent, I stamped the speedometer on Very Vanilla with chocolate chip ink, punched out the circles and matted them on Baja Breeze card stock sponged with chocolate chip ink. Then, I used a Game Spinner arrow for the center of the speedometer, and of course I put it all the way to 100 mph! The color combo used here is Tempting Turquoise, Pear Pizazz and Chocolate Chip. It’s a go to combination for me. 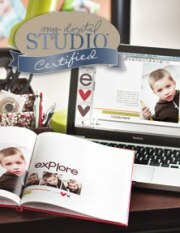 By changing up the stamps, it works for boys or girls, women or men. In this case, it was for a boy’s birthday, but just as easily could be appropriate for anyone. I stamped the Pear Pizazz layer with Hello Friend (available July 1st) in Versamark ink and heat embossed with Clear Embossing Powder. 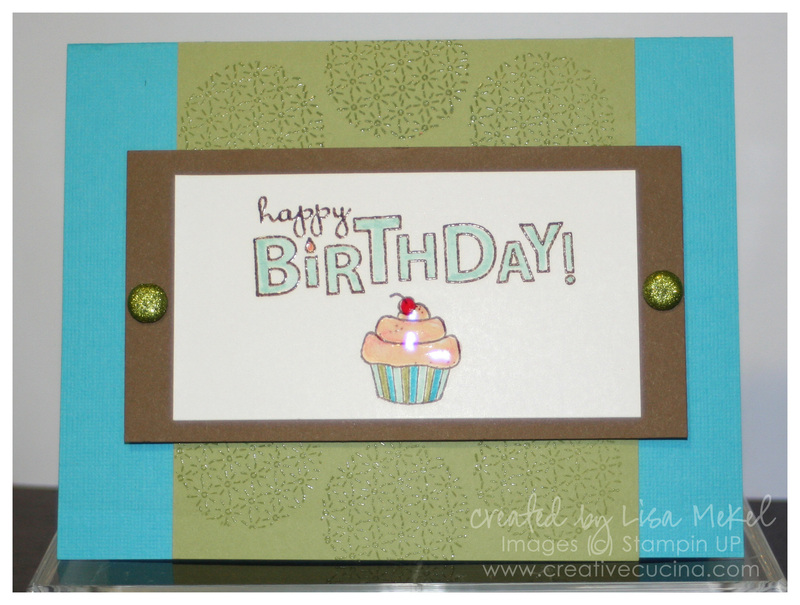 “Happy Birthday” is from Bring on the Cake, stamped in Chocolate Chip craft ink and Clear Embossing Powder. I colored in the letters with new In Color Pool Party Marker.